Former President Suharto, hailed as the father of development by some Indonesians during his 32 years in power - and accused of corruption and rights abuses by others - died yesterday after a long illness. He was 86. He died in hospital after lapsing into a coma and suffering multiple organ failure. The former strongman steered Indonesia through three decades of rapid economic growth and stability, only to see much of his work unravel in months as the country was plunged into chaos. 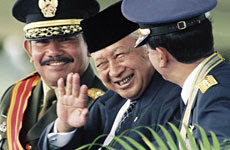 The ex-general was swept out of office on May 21, 1998 amid a savage economic crisis, mass protests and riots in Jakarta that killed 1200, while his own legacy was tarnished by charges his family had plundered billions of dollars through corrupt deals. Isn’t it nice to see a corrupt butcher die? This evil man stole $45 Billion from his own people and committed a genocide on the people of East Timor, one hope that there is a special Hell reserved for vermin like Suharto, and let’s never forget our own country’s despicable green lighting of his horror in East Timor and remind ourselves that no amount of economic stability defends the murder of almost a third of a country. May you burn in hell Suharto, burn long, and burn bright. Notice, no mention of East Timor in his obituaries.